Facebook is hot. There’s no question that Facbeook has a large audience. But what does this mean for marketers and business owners? Here are three recent Facebook-related studies that answer these very questions by examining how much time Facebook users invest in the platform, if Facebook ads are effective and other Facebook trends among online merchants. According to recent findings by market researcher Morpace, U.S. Facebook users are on the site for 1 of every 3 minutes of time spent online. Users 18 to 34 years old spend the most time on the site per week (8.5 hours out of 22.4 spent online). Users 55 and older spend an average of 4.6 hours per week on Facebook. The study also explored Facebook activity by ethnicity. According to the results, Asians were the heaviest users of Facebook. As a group, they devoted the most of their Internet time per week to Facebook (39.6%). African Americans were the second heaviest users at 35.1%. Hispanics spent the least amount of time on Facebook (31.7%). 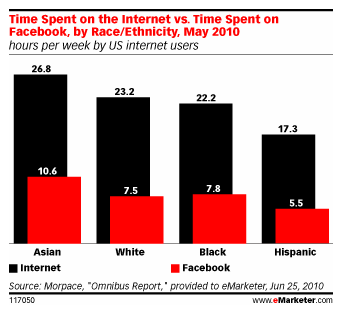 Here's the breakdown by race/ethnicity of time spent on the Internet versus time spent on Facebook. One of the most interesting stats from this study showed that Facebook users making at least $100,000 annually spent the most time on Facebook and on the web as a whole. This is valuable information for companies selling products and services online. Facebook users spend more time looking at ads on their own Facebook profiles than they do on news feed pages (their homepages), found a new report by Mulley Communications. Specifically, the study found that 71% of users looked at advertisements on their profile pages, while only 31% of users looked at advertisements on the news feed page. In addition, 53% of users pay attention to page updates in their news feed wall, which may explain why they mostly ignore ads on their pages. Here’s a short video to show the heat map of the news feed from the study. Notice how there’s little activity in the right-hand side of the wall. There’s been a lot of discussion about retailers extending the power of Facebook to their sites. Website conversion company SeeWhy found that 35% of ecommerce online marketers have implemented Facebook’s “Like” plugin, while 33% plan to do so in the near future. The second most popular Facebook social plugin was the login application, as 18% reported they had implemented it and 15% said they plan to do so in the future. The login plugin allows consumers to skip the registration step and login directly from the merchant’s site. This allows conversion to be simple and quick, which is a huge advantage for the merchant. Facebook social plugins have been getting a lot of attention from online merchants because they can drive traffic back to their own sites without having to build an entire ecommerce site into their Facebook page. Although 26% of respondents said they plan to build ecommerce applications on Facebook itself, 67% said they plan to use Facebook to actually drive traffic to their sites. In addition, 44% said they plan to use Facebook applications in place of microsites for launches and specific promotions. 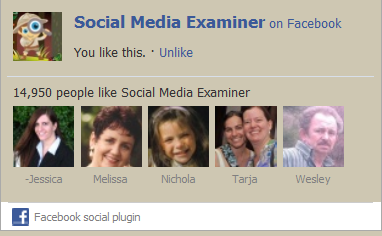 Here's an example of the "Like" social plugin on the SocialMediaExaminer.com website. Fans can "like" the page without being directly on our Facebook page. We want to hear from you! What do you think about these Facebook studies? Do the findings help shape your social media strategy? Let us know your thoughts in the box below.